The image below shows Orbiter at an altitude of about 300 km above the Earth in the ISS orbit just prior to docking with the space station. In this topic we further describe elements of an Adaptive Conditional Feedback Control Navigation Process and illustrate it using our spreadsheet. A 1955 paper "Conditional Feedback Systems -----" is available from the Download tab. Navigation of Orbiter in Earth Orbit bears no resemblance to the experience of driving a car. In orbit he influence of gravity on motion is not constrained by the surface of a roadway. It is easy to steer from your own location to that of your destination when there are wheels on the ground. The main rocket engines provide a nearly fixed amount of thrust when on and none when off. Orbiter does not quickly decelerate when the engines are off. It continues with little atmospheric or other friction to slow it. On Earth cars may travel at different speeds along the same roadway. All objects in a given Earth orbit travel at the same speed. Changing the speed changes the orbit. The difficulties of navigation in orbit suggest that computers be employed in the navigation process, as will now be described. The navigation process consists of Objectives and the Commands that are designed to achieve those objectives. A purpose of the 'Model Computer' is to design the Commands. It does this by sequentially adjusting command values on a model of the vehicle and its environment until they are seen to be what is needed to achieve the objectives. As a simple example, presume that the vehicle is coasting in a low and very circular Earth orbit. Apogee and perigee are equal at an altitude of 300 km. Then suppose, as an objective, that it is desired to raise the altitude of the vehicle's apogee by 200 metres while maintaining the current 300 km perigee altitude. Adding thrust to change the vehicle's velocity should accomplish this but how much thrust in what heading? Suppose further that we require the thrust to take place over a 175 second interval as we are approaching the use of another objective and want the changes to occur quite slowly so that corrections can be readily made if required. The objectives are provided to the Model Computer, which by fast iteration, akin to trial and error, determines the command to be given to the Course Computer. The Model Computer is constantly aware of the vehicle's state via its connection to the State Computer and within seconds the command "Apply a force of 30.857 Newtons for a period of 175 seconds at the current azimuth angle and with 0.0 degrees of elevation." is presented to the Control Computer. That is not the end of it. The Model Computer had created a detailed path that the vehicle should follow after it has been given the command. However, there are many influences that may cause the actual path taken by the vehicle as provided by the State Computer, and the path predicted by the model, to differ as time passes. Any significant departure from the objective requires alteration of the Course Computer's current commands or the issue of corrective commands. For example, reduce the time of the thrust by a certain amount or decrease the elevation angle of the thrust by an amount. Additionally it may be found necessary to update the model. This is an adaptive conditional feedback process. Importantly, the forgoing section has introduced the notion of the error between the result expected from the command and the result realized by the command being used to correctively alter the command, and possibly the model, in a manner that will reduce the error. This is the essence of our navigation system. This simple example is a case of delicate manoeuvring with the RCS. The OMS engines operate with a very much greater combined fixed thrust of ~53,400 Newtons and are not useful for delicate positioning. There are two OMS engines. The Course Computer must do the detailed work of controlling, instant by instant, the angles of each thrust gimbal with respect to the orientation of the vehicle and the vectoring of the RCS thrust when it comes into play. The bearing command that it receives is a bearing that is relative to the tangent plane at every position along its path during the interval that the corresponding thrust is applied. It employs the planned course that accompanied the Thrust and Bearing command, passed to it by the Model Computer, to compute the time-varying angles required along the path for the gimbaled thrusters in order to maintain the required bearing relative to the current tangent plane. The fast iteration method of finding course commands is illustrated using the spreadsheet. Specialized Solvers are added to the combination of Input Table and the spreadsheet model described in Topic 3 of Chapter 7. The ingredients of a Solver are Objectives, calculated Results from a model, an Error, Sensitivities and Controllables. The model produces Results. Results are compared with Objectives to produce an Error. Numerical differentiation provides the sensitivity of the error to each controllable. The sensitivities provide a vector of changes to be made to the controllables that reduce the error. The process is iterative and reduces the error with each iteration so that the Results become closely equal to the Objectives. In our application the controllables are the elements of a Course Command. Initial values of the controllables are applied to the model and the result is a computed path taken by the vehicle. Data from the computed path is compared with data from the objective to compute an error. The sensitivity of the error to small changes in each of the controllables is determined for each controllable by recomputing the error when a small change is made to that controllable. Each controllable is then modified a small amount in proportion to its sensitivity and will thereby reduce the total error a small amount. This process repeats, iterates, until the course command results in a computed path that is adequately close to the objective path. The addition of the Input Table and Solver to the three-dimensional spreadsheet model of rotating earth and atmosphere created a powerful tool capable of solving for thrust vectors that will take a space vehicle from one state to another. The method could have been employed at lift-off to guide the main engines and booster rockets, to reach a desired altitude and desired inclination at the time that the boosters are dropped. It could be used thereafter to guide the main engines to maximum altitude and velocity at the point called MECO where the near empty External Fuel Tank is jettisoned. Suppose that the parameters that were used to represent the MECO state of Orbiter, prior to the first burn, were highly accurate position, velocity and orientation data, provided by the State Computer. The OMS engines have not been previously operated and we are unsure of their precise thrusts and their balance. Orbiter's on-board Model Computer is able to use the known MECO state to compute the thrusting times and angles based on the nominal thrust of the OMS engines and their nominal response to bearing commands to reach a desired position in the ISS orbit. On any particular mission the thrusts of the two OMS engines may each differ from their nominal values. Imbalance in the thrusts will cause some offset to occur between a commanded thrust and bearing and the resulting achieved thrust and bearing. If the OMS engines and bearing controls were at nominal, all would be well and Orbiter would reach its objective. If not, how could corrections for thrusts, burn times and bearings be obtained? The object is to find out, early in the first OMS burn, how much the actual OMS engine thrust differs from its nominal value and by how much Orbiter's response to a bearing command differs from that desired. The procedure to determine such an imbalance can be demonstrated by supposing that the thrust and azimuth values of the first burn did not produce the trajectory that was calculated for the first burn. Fundamental state data is produced by the Model Computer every 0.01 seconds. These are the x, y, z position values and the corresponding Vx, Vy, Vz velocity values. All other values such as latitude, longitude, bearing angles, altitude, speed and acceleration are derived from the fundamental state data. 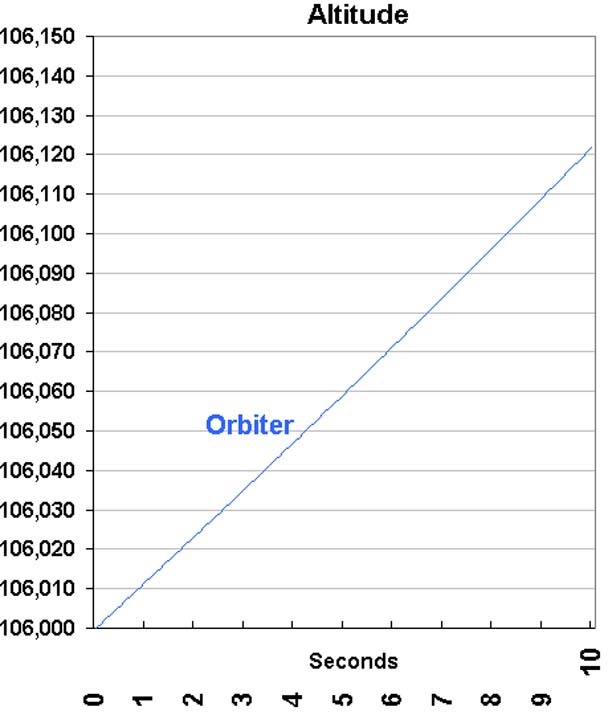 When thrust at a bearing is applied for a time to Orbiter, the state description of Orbiter will change smoothly from one state to the next. Given a sequence of states that occur, is it possible to determine the causative thrust and bearing? The answer is, as Newton put it, "pretty nearly". In the first 5 seconds after MECO an actual value of 52,400 Newtons has been found for the thrust of the particular OMS engines, as has a 2.0-degree offset from nominal of the Azimuth controller. The x, y, z state of Orbiter 5 seconds after MECO, may now be used to compute corrective new burn times and adjusted azimuth values, for the first and second burns that are required to achieve the orbit of the ISS. As there are 9 seconds remaining of the first burn there is time in which its azimuth and its thrusting time can be corrected to bring the path closer to a desired path. In our system of navigation, navigation corrections like those that have been described for the first few seconds after MECO, are part of a continuous course correction process that takes place from launch up to the point of close proximity to the space station. Comparison of the calculated position states with actual position states can be used to refine thrust values, the elevation angle and bearing of thrusts and to refine the mass and rate of loss of mass values of the Orbiter model. Over a longer-term basis, buoyancy, lift values, and even Cd and effective area could be refined so as to improve the model as the trajectory continues. Parameters that have the least effect on the trajectory require greater observation time for their determination than those parameters that that have larger effect. It is also quite possible that each mission of Orbiter could be used to contribute some to the atmospheric parameters of the Orbiter model. An increase in velocity resulted in an eccentric orbit with perigee at 300km. A decrease resulted in an eccentric orbit with apogee at 300km. Neither an Input Table nor a Solver is required to create this example. The orbital energy must be shed to the atmosphere on a return flight to Earth. For perspective, a Canadian electrically heated and cooled single-family dwelling might use 15,000 kWh of electrical energy per year. Consider Orbiter in a circular orbit at 300 km. There is a need to increase the altitude by one km. One might imagine that a short vertical burn with the RCS would be helpful. See the effect of such a burn in the left panel of the image that follows. After a waiting time to reach the 301 km apogee, the orbit is circularized at that altitude, right panel. In total, about 300,000 Newton seconds was employed. It took about 1,380 seconds to increase the altitude of the orbit by 1 km. The azimuth of the circularizing burn was chosen to maintain an inclination of 51.6 degrees. The RCS might possibly, instead, have been used to rotate Orbiter to allow the OMS engines to thrust vertically and later tangentially. 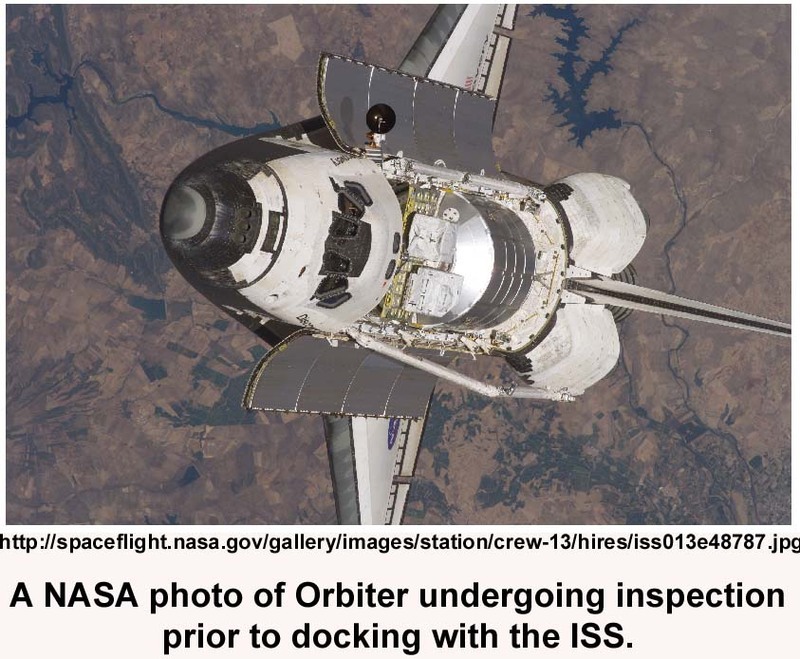 If so, at nominal OMS thrust, a burn time of about 2.27 seconds would have been required to reach the 301 km altitude and about 3.35 seconds would have been required to circularize. The OMS engines can be operated for as short two seconds but it seems unlikely that they would be considered precise enough for this application. Note that apogee in this case is delayed by factor of two as compared with the use of vertical force. Note also that the circularizing force has the same value as that employed to reach the 301 km altitude with the vertical burn, as might be expected. Also, given the large inertia of Orbiter, there is not much difference in the effect provided by a 20 second application of 1512 Newtons and the effect of a 30,240 Newton Second impulse. For this reason, the forces employed could be increased and applied for proportionately less time, or decreased by some amount and applied for more time, and have much the same effect. In raising the altitude of an orbit it appears that tangential thrusting requires less Newton Seconds than does vertical thrusting but more time is required to reach the new orbit. Choosing a thrust elevation that is intermediate between 0 and 90 degrees provides flexibility in the time taken to reach the higher orbit. When maneuvering near rendezvous, vertical thrusting may become quite important. A first pass rendezvous of Orbiter and the ISS. A delayed rendezvous. Summing up.